Despite aggressive campaigns to discourage kids from starting to smoke, tobacco use has stayed the same among middle- and high-school aged students in five recent years, federal officials report. They blame a sharp increase in teens use of e-cigarettes and hookahs, which experts say could lead to significant health harms. 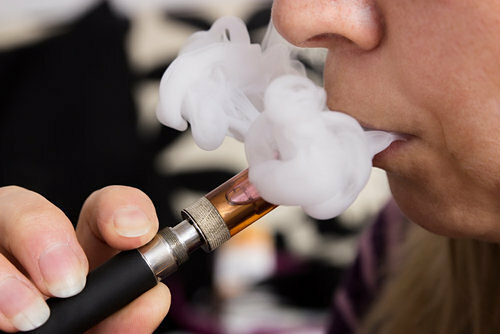 Substantial increases were observed in current e-cigarette and hookah use among middle and high school students, resulting in an overall estimated total of 2.4 million e-cigarette youth users and an estimated 1.6 million hookah youth users in 2014. Statistically significant decreases occurred in the use of cigarettes, cigars, tobacco pipes, bidis, and snus. The increases in current use of e-cigarettes and hookahs offset the decreases in current use of other tobacco products, resulting in no change in overall current tobacco use among middle and high school students. In 2014, one in four high school students and one in 13 middle school students used one or more tobacco products in the last 30 days. In 2014 … current e-cigarette use surpassed current use of every other tobacco product, including cigarettes. Health experts fear that vaping (use of e-cigarettes) and hookahs help hook kids on smoking, leading them to cigarette, cigar, and pipe use─a proven, top health risk that leads to cancers and lung and health diseases, increasing death rates. Researchers haven’t built the iron-clad case, yet, that vaping, in particular, in fact helps keep users away from cigarettes and cigars. Although their advocates say e-cigarettes eliminate or reduce exposure to some known carcinogens that are part of regular cigarettes’ burning of tobacco, evidence grows by the day that vaping can damage users’ health in an array of ways, as I have written before. Federal officials also hastened to note that exposure to nicotine─a key part of the high in vaping and hookah use─can be harmful to teens’ normal development. The research on highly addictive nicotine’s harm to kids is plentiful. But for now, the barrage of vaping advertising and Big Tobacco’s insidious promotion of its potentially deadly new products lie just beyond regulators’ reach. New regulations are still in the research phase. Health officials have called for stepped up campaigns to increase youngsters’ awareness of tobacco’s dangers. That’s not easy to do, as I have written before, not just because vaping and hookah use are promoted by celebrities of the moment to the young as cool and trendy but also because, hidden in the background, Big Tobacco is up to its old tricks, selling e-cigarettes, for example, under brands and labels that many may not realize are theirs.